We are pleased and excited to share, our original matching grant of $20,000.00 was just increased to $24,000.00. What does that mean for you and Minnesota Marriage Encounter? It means that dollar for dollar you donate to us during Give to the Max Day is matched. When you donate $60.00, the amount is doubled. That’s $120.00, which is half a Marriage Encounter registration fee. Please consider helping us reach our goal during Give to the Max Day, November 15, 2018. Early giving is underway. 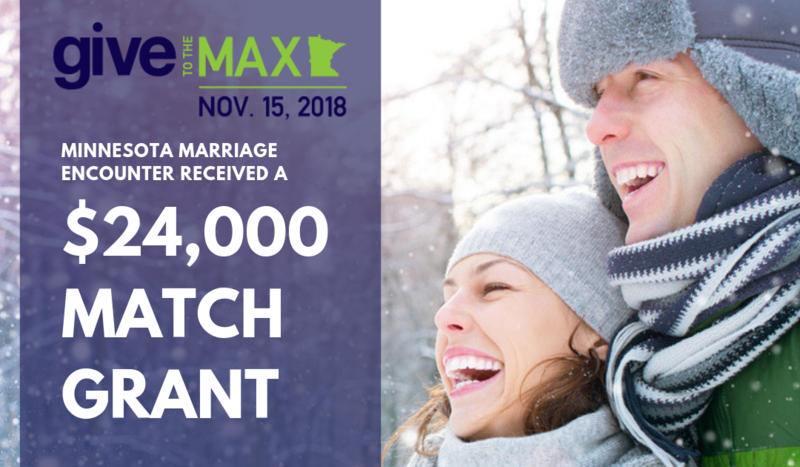 Your donation goes to our Scholarship Fund which helps couples in financial difficulty to attend a Marriage Encounter Weekend free of charge in Minnesota and surrounding states and strengthen their marriage.